Want to find out more? Contact us, we'd be delighted to hear from you. Designed to help students use research methods to define, implement and evaluate potential solutions for very real business issues, the DBA and PhD programme consists of two stages: the course stage and the research stage. The course stage will give you the knowledge and expertise you need to develop the topic of your thesis and understanding of the research process. 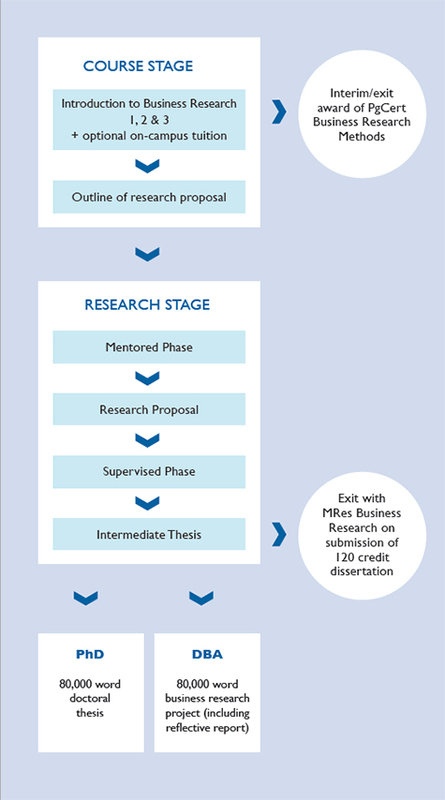 The research stage consists of two phases, the mentored phase and the supervised phase; on completion of these, you will submit your final thesis for examination, which takes place in the form of an oral defence. an official transcript of your Master’s degree. Enquire direct about this programme.